Hassanzadeh Seyedi, A., Hosseinkhani, A. (2014). Evaluation Corn Gluten Meal Nutritive Value for Broiler Chicks. 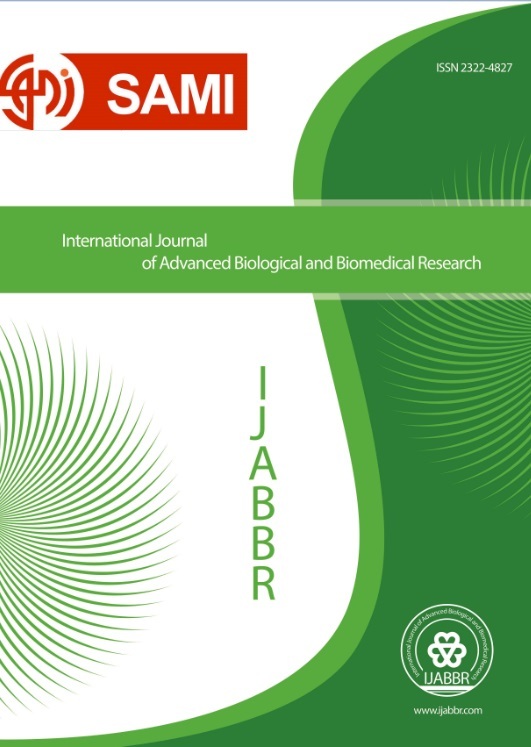 International Journal of Advanced Biological and Biomedical Research, 2(9), 2609-2615. Arash Hassanzadeh Seyedi; Ali Hosseinkhani. "Evaluation Corn Gluten Meal Nutritive Value for Broiler Chicks". International Journal of Advanced Biological and Biomedical Research, 2, 9, 2014, 2609-2615. Hassanzadeh Seyedi, A., Hosseinkhani, A. (2014). 'Evaluation Corn Gluten Meal Nutritive Value for Broiler Chicks', International Journal of Advanced Biological and Biomedical Research, 2(9), pp. 2609-2615. Hassanzadeh Seyedi, A., Hosseinkhani, A. Evaluation Corn Gluten Meal Nutritive Value for Broiler Chicks. International Journal of Advanced Biological and Biomedical Research, 2014; 2(9): 2609-2615. Objective: The aim of this experiment was to determine chemical composition, protein quality of corn gluten meal (CGM) and its effect on growth performance of broiler chicks. Methods: Chemical composition and nitrogen corrected true metabolizable energy of CGM was determined by standard and precision-fed cockerel assay methods. For evaluating of protein quality, 90 male broiler chicks in a completely randomized design was used and fed experimental diets from 8 to 17 days of age and in the growth assay, 1200-day-old broiler chickens in a completely randomized design were used for evaluating effects of four levels of CGM on the growth performance, carcass characteristics. Results: The average of TMEn and crude protein content of CGM sample were 4145 kcal/kg and 60.44 %, respectively. The protein efficiency ratio (PER) and Net protein ratio (NPR) values for CGM were 1.26 and 2.30, respectively. The growth assay result showed that the all level of CGM had positive effect on broiler performance (P<0.01), While, the best weight gain and FCR were obtained in the birds were fed 12% of CGM in different weeks of experimental period. Conclusions: Therefore, it is suggested that the CGM can be used in the ration for improvement broiler chicks’ performance.